J'ai cherché partout, mais je ne l'ai trouvé nulle part. I looked everywhere, but I didn't find it anywhere. There is nowhere where I would rather be. Comme il pleuvait, Lise n'est allée nulle part. Je n'ai vu Mathieu nulle part. I didn't see Mathieu anywhere. 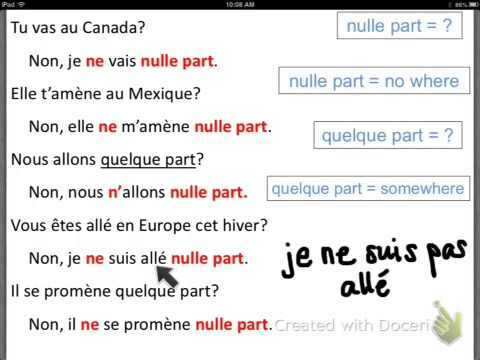 Ne/n' ... nulle part means nowhere/ not anywhere. Note that when used on its own, you don't put ne/n'. Où vas-tu? - Nulle part, pourquoi? Where are you going? - Nowhere, why? Il n'y a pas de pollution nulle part. Merci beaucoup Monsieur Chris. But I still can't understand how 'la' changes to 'de' and why is there Pas ?Also will pollution come before 'nulle part' ? Il y a de la pollution partout. I don't hear this being pronounces as préférerais BUT as préférais. Indeed, the distinction here is very tenuous, even to Native ears :)Note however that although you can perfectly pronounce the "e" as in [préférerais] (which the updated audio file now does), many French people would pronounce this word as [préférrais], stressing the R and kind of skipping the [e] sound altogether, which makes the nuance very tricky to catch for non-Native ears! I hope that's helpful!Merci et bonne journée ! In one of the questions on an exam, the correct answer was "Il ne voit Julie nulle part". Why is Julie included in between "ne" and "nulle part" while a sentence like "Il ne voit pas Julie" has Julie outside of the negation? Bonjour Jeffrey, Thank you for your question. "Ne ... nulle part" is indeed a bit different from other negations, and our lesson has now been updated to fully reflect this. Please have a look: https://www.french-test.com/revision/grammar/how-to-say-nowhere-ne-nulle-part-negative-expressions I hope this is helpful! Merci!